Our HermiTux paper won the best paper award at VEE 2019. Comparison of disk footprint, boot time, and memory usage for a Linux VM, a HermiTux/OSv/Rumprun unikernel, and a Docker container. For more details see our VEE’19 paper. HermiTux is based on the HermitCore operating system. For a detailed description please read Hermitux’s VEE 2019 paper and Daniel Chiba’s MS Thesis at Virginia Tech. 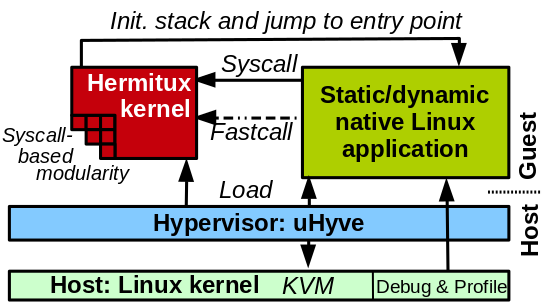 HermiTux uses a lightweight KVM-based hypervisor that loads the Linux binary alongside a minimal OS layer within a single address space virtual machine. At runtime, system calls made by the application are caught by HermiTux’s kernel. Optionally, HermiTux provides a mechanism to rewrite system call invocation into common function calls to the kernel, significantly reducing the system call latency. HermiTux can also analyze a Linux binary to determine which system calls it invokes, and compile a custom kernel containing only the implementations of these particular system calls. HermiTux is an open-source project of the Systems Software Research Group at Virginia Tech. HermiTux is supported in part by ONR under grants N00014-16-1-2104, N00014-16-1-2711, and N00014-16-1-2818. Any opinions, findings, and conclusions or recommendations expressed in this site are those of the author(s) and do not necessarily reflect the views of ONR. HermitCore’s Emoji is provided free by EmojiOne. hermitux is maintained by ssrg-vt. This page was generated by GitHub Pages.